Dungeon Souls by Lamina Studios has been on the minds of most indie gamers (especially the Roguelike variety) for a while now, ever since it entered Early Access some months ago. The game finally made the jump from Early Access to Full Release and Hyper Light Up got the chance to review the game’s completed version. 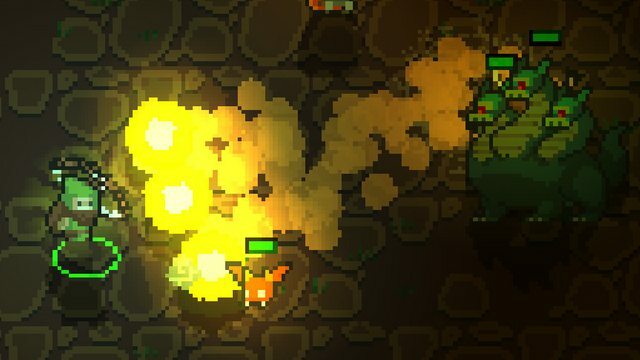 Dungeon Souls is a roguelike indie game that takes inspiration from games such as Nuclear Throne and Risk of Rain. Using one of ten different characters, we have to navigate through the game’s levels and face the enemies inside in order to reach the end. To do that, we need swift reflexes and quick thinking, since Dungeon Souls always has things happening on the screen. This is because, unlike other Roguelikes, the whole level is linked together and not separated into rooms. This means that we always have a few enemies coming our way. Clearing a level in Dungeon Souls is a tough bussiness. When we enter one, we see on the bottom of our screen that we have to activate a set number of portals. Activating one of them causes enemies to appear around it, which we have to face. Once all the portals are activated, we have a few seconds to leave the level through a portal. If we don’t leave, a monster known as the Redeemer appears in the level and starts to hunt us down. This means that we need to be methodical when clearing a level and plot an advantageous course through it. The more prepared we are before we start activating portals, the more things we can get in the level. For example, every level contains a shop where we can buy one of three items. Moreover, there are chests of varying rarities that can give us items as well. Items are a big factor in how well a run can go in Dungeon Souls. Although our character can level up during the run, giving us a chance to improve one of his skills each time (such as attack, movement, accuracy and defense), these upgrades improve our skills by one point. Items, on the other hand, can improve a skill by five points or more. Moreover, apart from items that improve our stats, there are also items that can affect the enemies. For example, there is one item that causes explosions when it hits an enemy and another that slows him down. There are also some more miscellaneous items, such as those who increase our parry or critical chance, active items, which can be used as weapons, and many more. While I had played Dungeon Souls before, when it was still in beta, I hadn’t opened up the game for a few months. When I started it up for the purposes of this review, I was pleasantly surpised. Dungeon Souls always had the core of the gameplay down, and was a fun game from the beggining. Having that in mind, it is obvious that the developers also used the game’s time in Early Access in order to make it prettier. There are new annotations, new sounds and more fluid animations. Generally, the game seems to have had many quality of life improvements, which certainly will affect its longevity. One thing that Dungeon Souls has that is different than most games of the genre is its progression. While in other games, like the Binding of Isaac, the focus is on getting more items as you proceed, in Dungeon Souls the focus is on characters. Seven out of the ten characters are initially locked. In order to unlock them, we need to complete some objectives, one for each character. Apart from that, the game also rewards you for playing a lot with one character. The experience our character gains during a run is stored and once we reach a set amount of net experience with him across all runs, he advances in rank. When he does that, his stats improve. In other words, the more we play with a character, the stronger he gets (the characters who level up also get a fly-like thing that follows them, which is kinda cute). Finally, we have the passives. Once we die in a run, the money we had on us up to that point is saved. As we acquire money, we can use it to buy some passives. Passives increase our attack, defense, regeneration and more, across all characters. Essentially, the more we play, the better for every character, even the ones we have not unlocked yet. In terms of music and looks, the game excels in both. The game’s aesthetic is quite similar to Nuclear Throne, but there are a few changes that make it stand out, such as the colour palette and the shading. As I mentioned above, the game’s animation is also very fluid. Moreover, the game’s music is also very fitting to its dungeon delving, with some nice changes whenever we fight a boss or enter a new area. For all the good things that Dungeon Souls has to offer (and there are a lot of those), there are also some issues. For example, the game is quite unbalanced in some aspects.It seems to me that ranged characters reign supreme in most cases, since I can destroy a boss in seconds with the thief class, but I usually die on it with the barbarian. While efforts to alleviate this have been made in the completed version of the game, and it shows, more need to be done. Another issue I have is the game’s controls. While they are generally quite good, sometimes my character slides around a bit or is a little too late in responding. Despite the above, Dungeon Souls is an excellent addition to the roguelike genre and can satisfy even the most diehard fans out there. The game is also still being updated regularly (there is already a hotfix out for version 1.0) which means any small issues that currently exist will be gone soon. You can find Dungeon Souls on Steam for 13 euros (there is also a 15% discount until December 9). 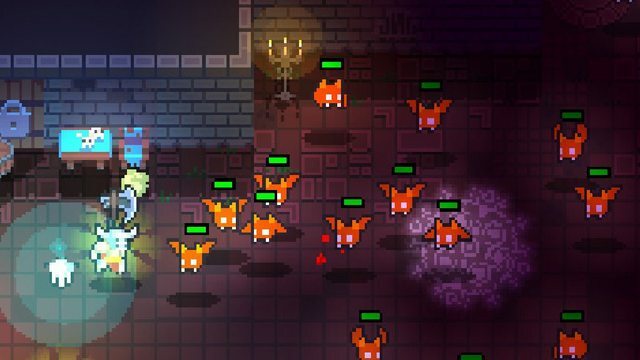 Dungeon Souls mixes the standard Roguelike recipe with some new enemies, such as the character progressions, resulting in a fantastic game which can offer even the best Roguelike players many hours of entertainment. Combined with the regular updates it’s getting, Dungeon Souls has a bright future ahead of it. + The music and aesthetic. + The character progressions system. – The game is unbalanced in a few areas.